The city anticipates huge protests should the NRA hold its upcoming annual convention there. A Dallas city official is urging the National Rifle Association (NRA) to hold its annual convention elsewhere in light of a number of deadly mass shootings in recent months, including one at a high school in Parkland, Florida last Wednesday in which 17 people were killed. The NRA’s annual meeting is scheduled for May 4-6 at the Kay Bailey Hutchison Convention Center, and has been arranged since 2012, when the city offered the space to the NRA for free in exchange for the revenue the 75,000 expected attendees would bring in to Dallas’s businesses. Caraway now expects huge protests in the city if the NRA goes ahead with its meeting. Caraway urged the NRA, which will permit the sale of ammunition at its convention, to join the national conversation regarding a ban on or strict regulation of military-style semi-automatic weapons including the AR-15, the gun that was used in Parkland, as well as in Sutherland Springs, Texas in November; Aurora, Colorado in 2012; San Bernardino, California in 2015; and several other mass shootings in recent years. The gun industry’s powerful lobbying group has regularly responded to pleas for stricter gun control by insisting that greater presence of firearms through concealed carry legislation would make Americans safer, and that a stronger mental health treatment system would reduce mass shootings. “Who needs an AR-15 to go hunting? Who needs an AR-15 to protect their house?” he added. 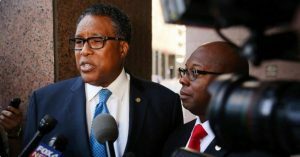 Caraway’s concerns over the weapon have been echoed by gun violence experts, many of whom say a ban of military-style semi-automatic weapons could cut down on mass shootings. Caraway has been joined by fellow council member Kevin Felder in calling on the NRA to take its convention elsewhere, and has urged other members to take positions and the city’s attorney to examine whether the meeting could be canceled.